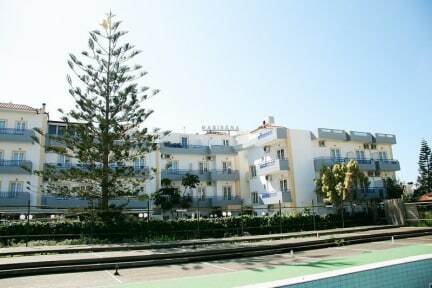 The Marirena Hotel is a modern complex of 50 apartments and studios, built with much care and passion. 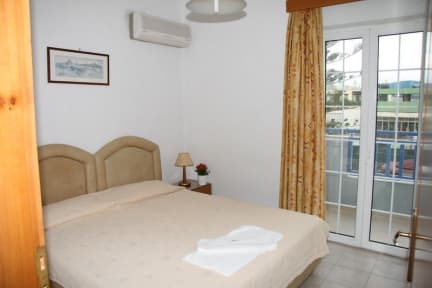 Located in the tourist area of Amoudara, 4 km west of Heraklion and just 100 meters from an endless and well organized beach. Perfect for those seeking tranquility and relaxation, alone or with their families, for those who want to combine work and relaxation, but also for explorers who want to discover the incomparable landscapes of Crete. To Marirena Hotel consists of apartments that can accommodate 2-4 persons Studio for 2-3 people. rooms are equipped with: refrigerator, kettle, phone, TV, safe, Crib, aircon. The rooms are shaped and decorated with care in order to meet your holiday needs. For lunch or dinner meal will be served to Dionysus, the hotel's restaurant where you can enjoy delicacies from the Cretan and Mediterranean cuisine, prepared with the finest ingredients (olive oil of our own production, fresh vegetables and local meat). There Also, the menu option for particular nutritional uses (dietetic, special health needs, etc.) upon request. At Snack Bar, located right next to the pool, you can sit back and let the caress of the sun. It offers a wide variety of snacks, refreshing drinks and cocktails. We require a valid credit card to proceed with your reservation. The remaining amount of the reservation will be preauthorized and charged on your arrival date of the booking by Click and Book Travel. For non valid credit cards you will receive an e-mail notification. We require your reply and valid credit card details within 3 working days. If you do not provide valid credit card details within 3 working days your booking may be cancelled.